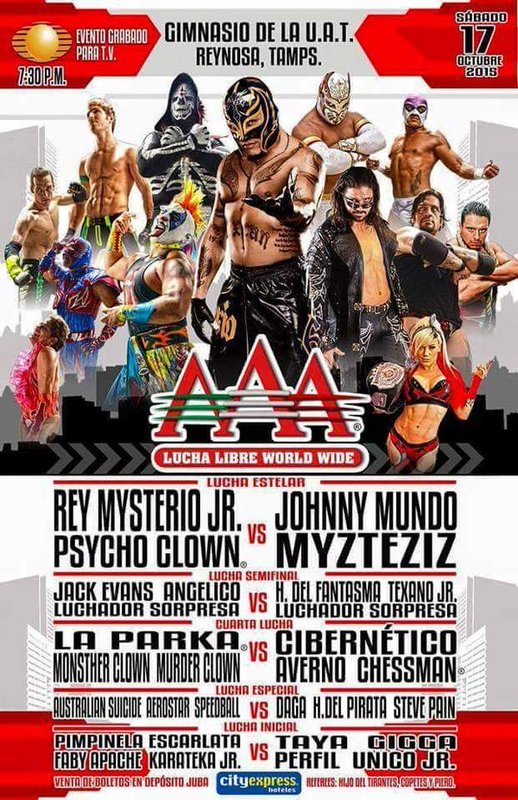 5) Electroshock, Jack Evans, La Parka vs Chessman, Parka Negra, Texano Jr.
5) Angélico, Fénix, Psycho Clown b Daga, Hijo del Fantasma, Pentagón Jr. 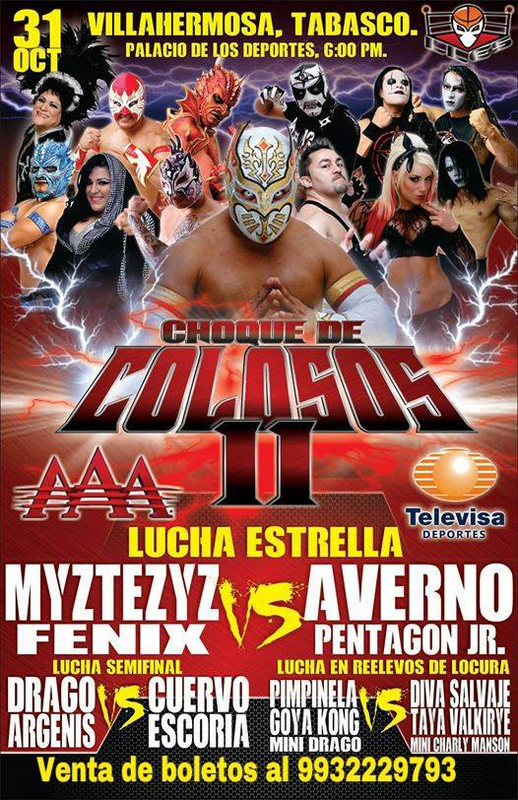 The two mystery people were Lady Shani (debuted on last taping) and Lady Maravilla. 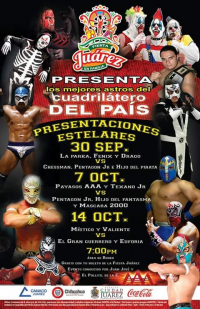 A good match, with Taya retaining by defeating (Lady) Maravilla. First defense. 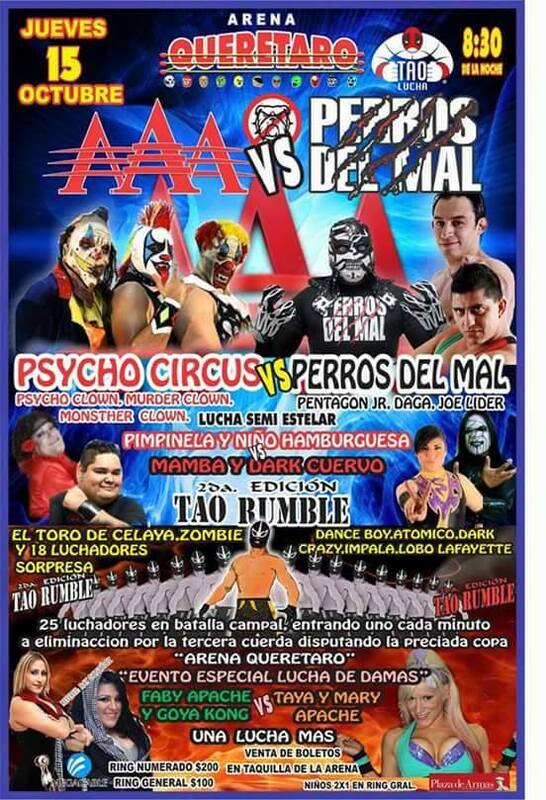 The two Perros del Mal teams fought like they were never allies. 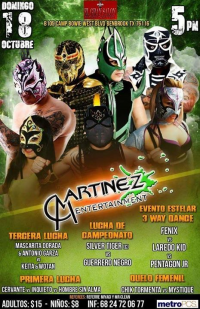 Myzteziz strangely came to the ring during the match, attacking everyone and costing Pentagon Jr. the win after a package piledriver. Most of the match chased Pentagon to the stage, leaving Steve Pain to be beat by Jack for the title change. 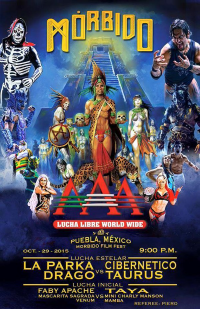 Jack & Angelico are tag champions. Lider & Pentagon end their reign with zero defenses, but signaled they wanted a rematch. 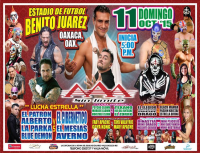 Drago & Fenix fought well, but lost to Cage & Mesias. 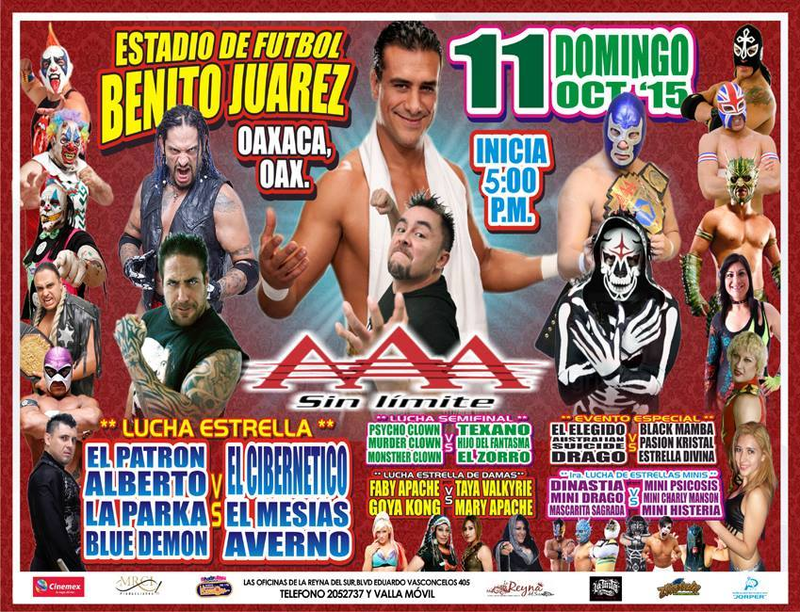 Mesias took Fenix's mask after the match. The debuting Taurus got the win, eliminating La Parka last in the usual royal rumble fashion. Antonio Pena was honored with a moment of appluase before the match. 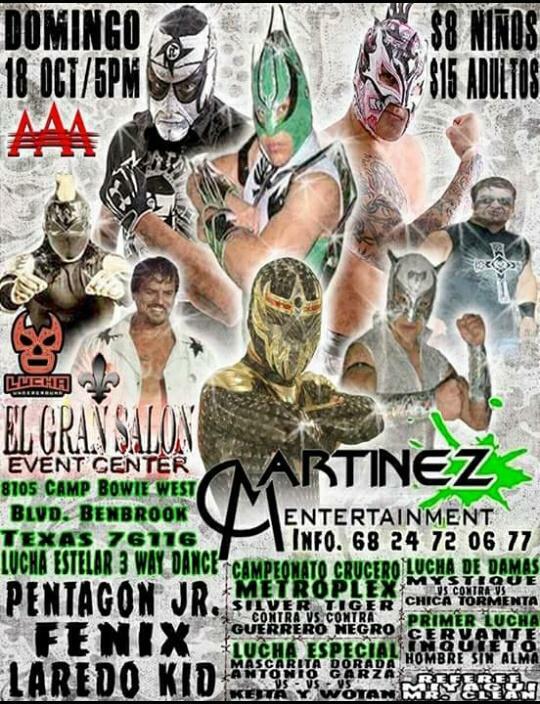 The debuting Garza Jr. is Hijo del Ninja, doing Hector Garza spots. He looked fine, but took the loss to Myzteziz. Myzteziz had problems with his partners but seemed on the same page after the win. second defense. Johnny was caught using a guitar as a weapon by Hijo del Tirantes. Mundo had earlier slapped Tirantes for not counting fast enough, so Tirantes called the DQ. 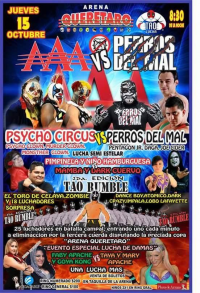 Cage (Mundo's second) and Mundo attacked Alberto and Psycho Clown (Alberto's second.) Rey made the save. Myzteziz attacked him. 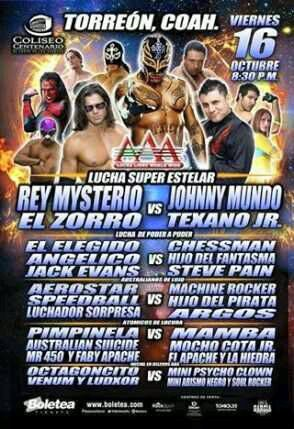 La Sociedad ran out to attack the tecnicos and Myzteziz, smashing a guitar over his head for betraying them earlier. Alberto and Rey eventually ran the rudos off the end the show, but did not save Myzteziz. 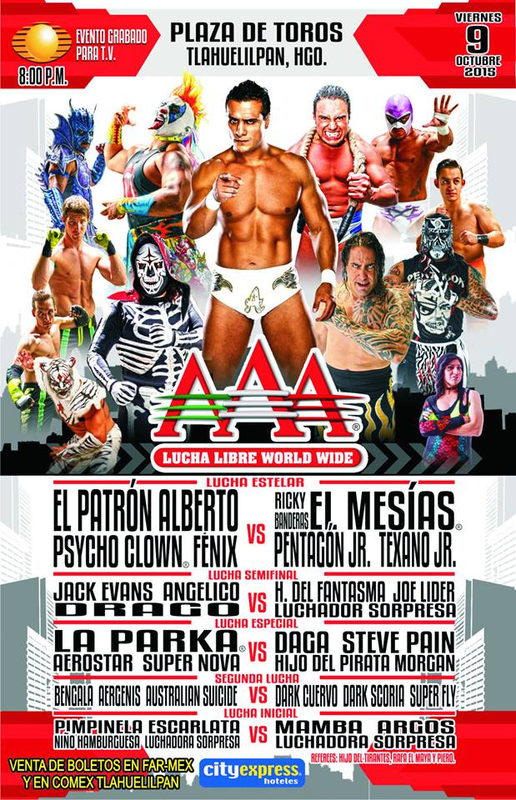 1) Murder Clown, Psycho Clown, Texano Jr. vs Hijo del Fantasma, Máscara Año 2000 Jr., Pentagón Jr.
7) Fénix, La Parka, Myzteziz vs Hijo del Fantasma, Parka Negra, Pentagón Jr.
scheduled main event became tercera, with Alberto saying he had to leave immediately after the match due to personal issues. 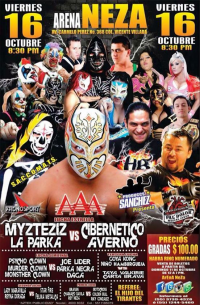 Chessman replaced Mesias (and Averno wrestled as scheduled. 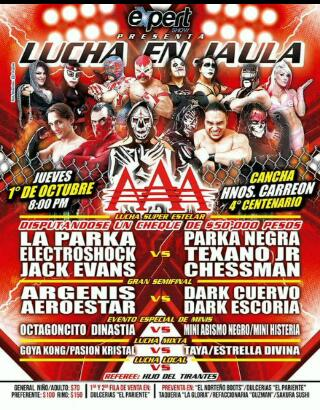 Listed as 4 on 3 with Jack Evans added? Rudos cheated to win. Psycho demanded a rematch. 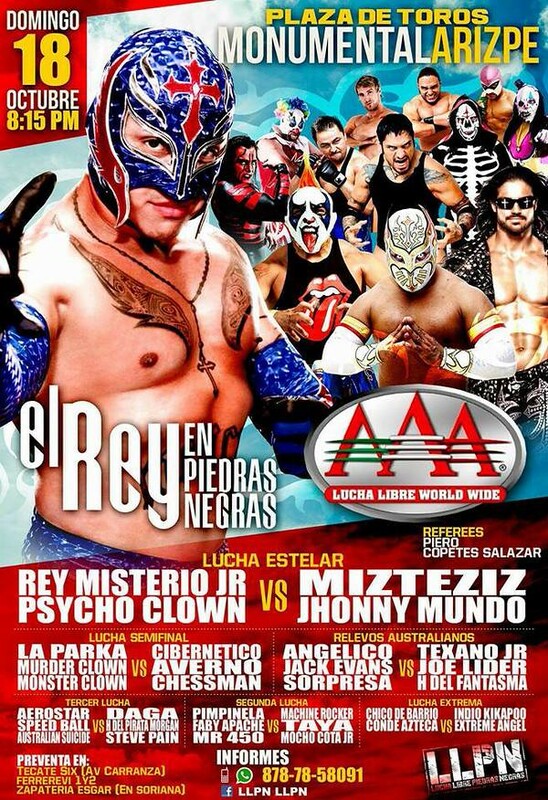 5) Monsther Clown, Murder Clown, Psycho Clown vs Daga, Joe Lider, Pentagón Jr.
2) Australian Suicide, Faby Apache, Mr. 450, Pimpinela Escarlata vs El Apache, La Hiedra, Mamba, Mocho Cota Jr.
5) Rey Mysterio Jr. & Zorro b Johnny Mundo & Texano Jr.
Mr. 450 and Imagen II were removed from this match. Mr. 450 and Machine Rocker were added to the match. Daga & Suicide continue to feud, with Daga using a middle rope Canadian Destroyer on Australian Suicide. Moved down a spot. 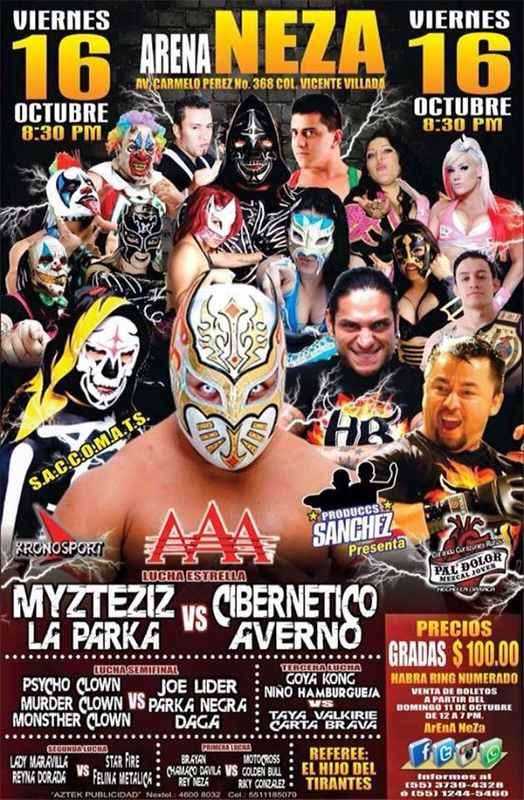 Garza Jr. and Taurus were the mystery wrestlers. Taurus defeated Jack with a Michinoku Driver to keeep his streak going. 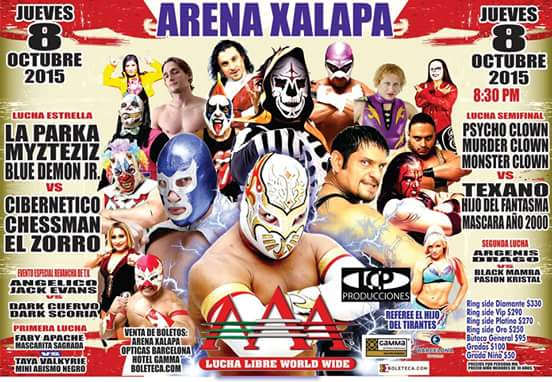 Sometime in here, Fantasma lead La Sociedad out to talk about winning all the titles (as usual. 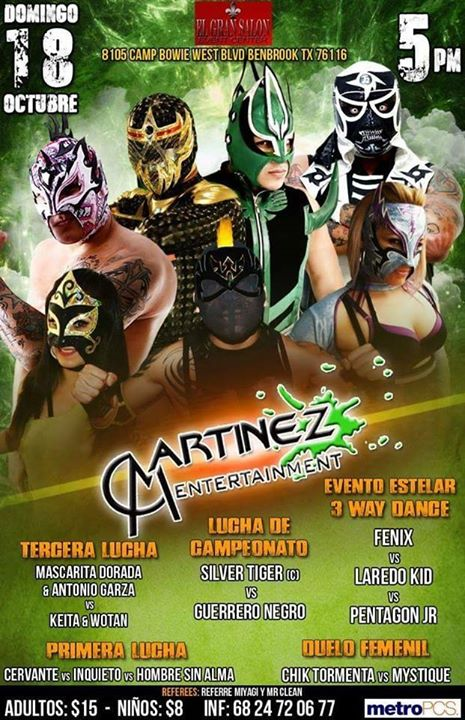 ).Fantasma said he'd defend the cruiserweight title at Guerra de Titanes and Texano Jr. threatened Garza Jr.
Electroshock replaced Myzteziz and lost to Rey. 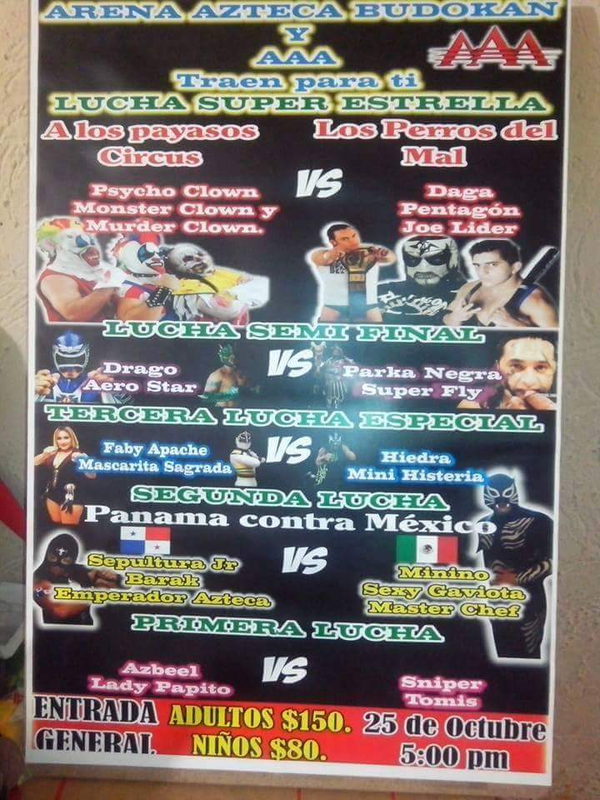 Mundo attacked Rey after the match and Electroshock tried to break it up. Mundo went after Electroshock instead. 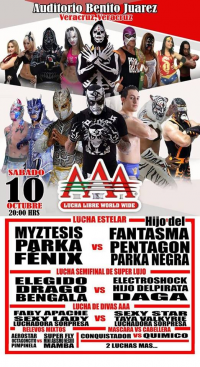 Daga, Steve Pain and Hijo del Pirata ran in and attacked Electroshock. 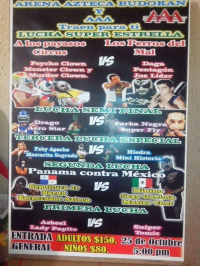 Rey and Psycho made the save, and Electroshock appears to be a tecnico. 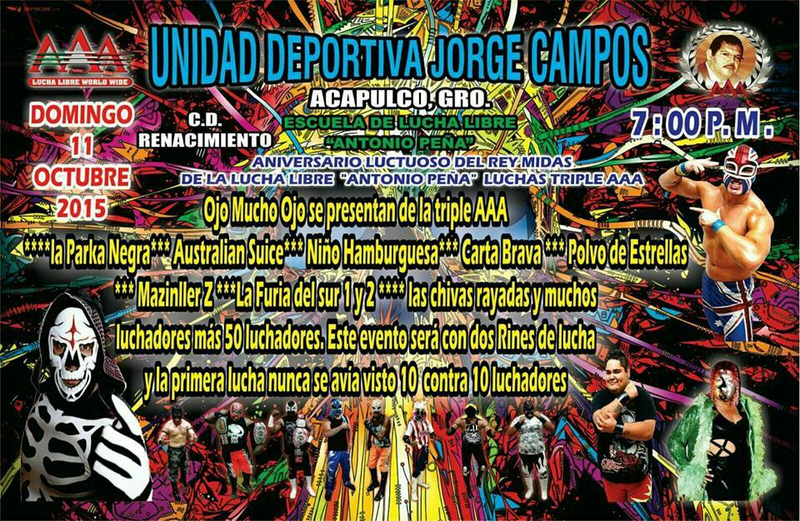 4) ?, Angélico, Jack Evans vs Hijo del Fantasma, Joe Lider, Texano Jr.
5) Argenis, Fénix, Myzteziz vs Electroshock, Ghefar, Pentagón Jr.
5) El Elegido & La Parka Jr. b Parka Negra & Pentagón Jr.
technically Taurus's first known loss (under that name), but spot shows don't really count. Mesias turned on his partners.